"Being an all inclusive resort is challenging as we put our standards high on every aspect of our resort, from service to the quality of food in each restaurant, and beverages in all bars. This award has proven our quality as an all inclusive resort"
The words were stated by the number one man at Samabe Bali Suites & Villas, Mr. Ralf Luthe. 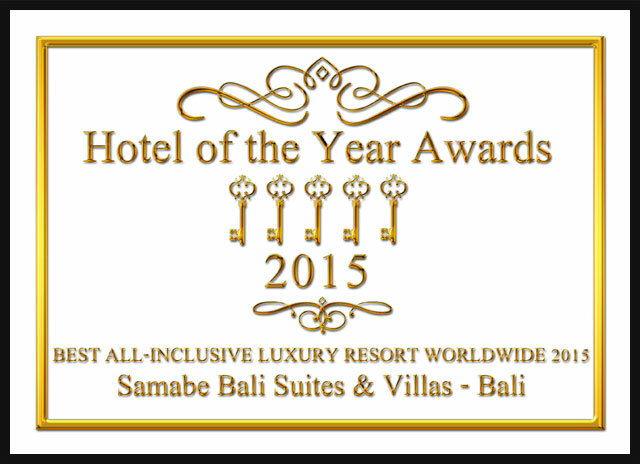 Being awarded by Hotel of The Year 2015 is a pride for the luxury resort in Bali. The awarding night took place in Budhapest in December 2015. Hotel of the year awards is to reward luxury 5 star hotels. The judgment is based on services, facilities, comments on Trip Advisor and other channels. It scored the hotels around the world to see if they have met the requirements of luxury hotel.